Chivas Brothers, the Scotch whisky and premium gin business of Pernod Ricard, is to extend its Cask Strength Edition range with the release of two exceptionally rare malt whiskies, available from distillery visitor centre shops and online at www.maltwhiskydistilleries.com*. Following the discovery of rare reserves from two distilleries no longer in existence, Highland malt Glenugie 32 Year Old and Lowland malt Inverleven 36 Year Old will complement the company’s six-strong range of Cask Strength Edition whiskies, all of which are non-chill-filtered. The two malts from extinct distilleries fittingly come with the additional title “Deoch an Doras”, a traditional Gaelic expression for a farewell drink**. Just 500 bottles of each new expression will be released. Bottled at 55.48% ABV, Deoch an Doras Glenugie is a non-chill filtered malt with rich notes of sherry, raisins and fruitcake, followed by tangy marmalade and spicy cinnamon. This exceptional whisky was distilled at Glenugie Distillery in Peterhead, which was in operation from 1831 until 1983 when it was closed due to the level of competition at the time. A 70cl bottle will retail at £250. 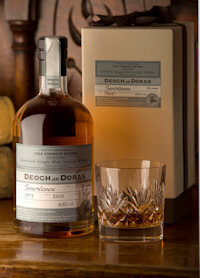 Deoch an Doras Inverleven is a rare non-chill filtered whisky, bottled at 48.85% ABV. Full of light citrus notes with creamy toffee and sweet candy apple flavours, a 70cl bottle will retail at £275. Inverleven Malt Distillery was built in 1938 within the Dumbarton grain distillery complex. The stills were decommissioned in 1991 and have since been removed. Douglas Callander, Heritage Director for Chivas Brothers says: “With both distilleries no longer in existence, these exceptionally rare malts are expected to attract attention from collectors and connoisseurs globally. Given Chivas Brothers’ long tradition and expertise in laying down significant quantities of Scotch whisky, specifically for extended, long-term maturation, we are confident that these two gems will be very well received."